Today I had an op/ed article published at Fox News. Heidi Klum bribes her kids to eat healthy food and I say good for her. I don’t happen to bribe my kids for making good food choices but I do pay for grades and on occasion I’ll dangle a few dollars overhead and exchange them for my keys if one of the kids can find them. The comments have been interesting. 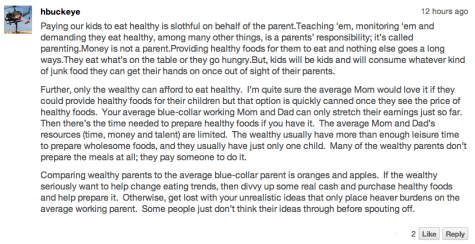 @fxnopinion @foxnews @jessicagottlieb Alternative (experienced parent) opinion: Feed them nothing else and they will eat what you feed them. @fxnopinion @jessicagottlieb Heidi klum is wrong, my kids will eat what I place on their plate. @fxnopinion @foxnews @jessicagottlieb Why is there unhealthy food in the house? Am I the only blogger on the planet with kids over the age of five? Does anyone recognize that children have free will, that they leave the house and buy things with money we’ve given them or that they’ve earned? Also I love that folks are like, “I would NEVER pay my children for anything. If I want to discipline them I just take away their video games.” Listen, I don’t care what currency you use, if you’re giving or withholding things to or from your kids there’s a currency involved. Life is full of transactions. I pay for grades. Klum pays for smoothies. Y’all pay for something. Just admit it. Agreed. As parents, we pay, one way or another. I pay my sons (ages 9 and 13) for good grades. I make their meals based on their (limited, but healthy) preferences. If they don’t like it, then they make their own meal.